Database is a common term in today’s life. Many enterprises, firms, organisation, institutes, etc. requires a database to store their data in a well-formatted form so that it would be easy to retrieve a useful information out of it. 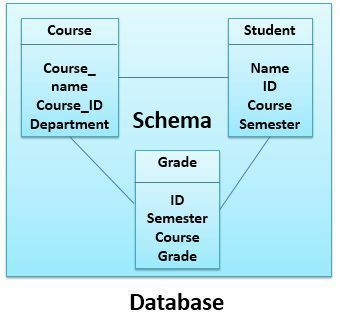 While designing a database, schema is specified that describes the structural view of a database which confirms the tables that would be involved in creating a database, the attributes for the table and their association. Schema has to to be specified during the designing phase of a database. Let us learn the differences between the terms schema and database with the help of the comparison chart shown below. Basic Schema is a structural view of a database. The database is a collection of interrelated data. Modification Schema once declared should not be modified frequently. Data in a database keeps on updating all time, so database modifies frequently. Include Schema includes tables name, fields name, its types and constraints. Database includes specified schema, data (records), constraints for the data. Statements DDL statements specify a schema for a database. DML statement adds, updates the records (data) in a database. Schema is a structural definition or description of an entire database. Once you declare the schema of a database, it should not be changed frequently as it will disturb the organisation of data in a database. Schema of a database can be displayed in the form of a diagram called schema diagram. The schema diagram displays what tables do a database contains, what are variables in those tables. How the tables are associated with each other. Though the schema diagram does not show each and every aspect of the database like, it does not show instances of the database, type of the attributes. The DDL (Data Definition Language) statements specify the schema for a database. It specifies the name of the table, the name of attributes their type, constraints and its association with other tables in a database. DDL statements are also used when the schema of a database is to be modified. 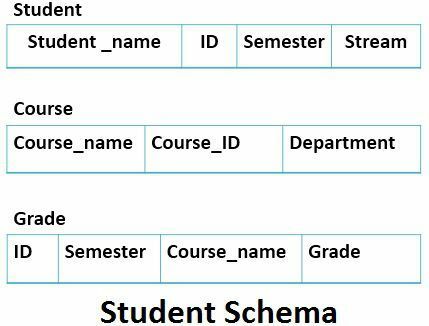 Shown below is the schema of a database with student information. You can see that it shows the name of all the tables and the variables of all those tables. The database is a collection of well-organised and interrelated data. The database includes structure (Schema), data types and constraints of the data to be stored and the data i.e. facts or information about an objects in consideration. The data in a database keeps on updating. Hence, the database gets changed frequently. DML command specifies the changes in data of the database. The data in the database at a particular moment is called database instance. A database can be of any size, it can be generated and operated manually or can be computerised. Now a days database is operated digitally. DBMS (Database Management System) is held responsible for creating and maintaining the data in a database. The basic difference between the two terms, schema and database lies in their definition i.e. database is a collection of facts or information about the considered object. On the other hand, Schema is a structural representation of the entire database. Once you declare a schema for a database, it won’t get frequently modified as it disturbs the organisation of data in the database. On the other hands, database updates frequently. On one side where a schema contains the structure of tables and attributes inside the tables, their types and constraints. The database consists of a schema, records for the tables. The DDL statement specifies the generation and modification of schema. DML statements specify generation and modification of the data inside the database. Before creating a database you have to create a schema that would define the outline for the formation of a database. A good schema is able to generate a good database. Schema should be created carefully as frequent changes are not accepted in a schema.